Inder Loves Folk Art: Happy Birthday Joe! 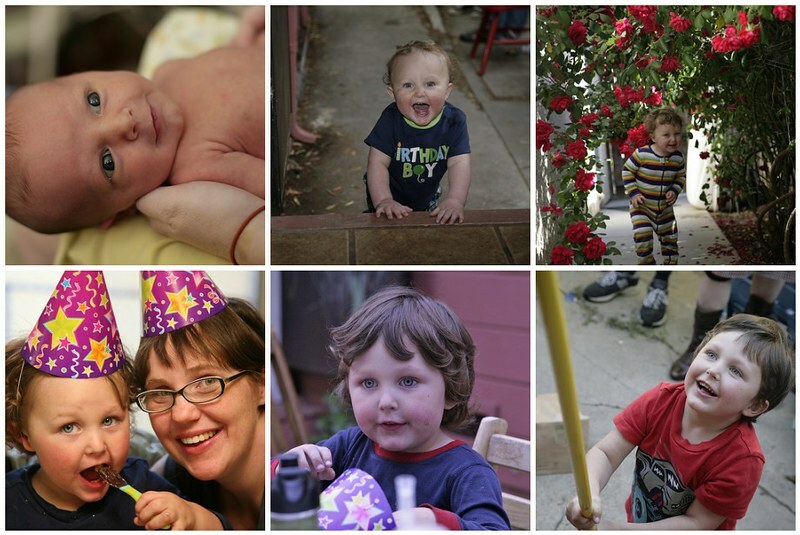 Five years ago today was a big day for me - I became a mother! To my fun-loving, stubborn, caring, independent Joe. Happy fifth birthday, my beautiful Joseph Roscoe. Yesterday we had a big party, which Joe helped plan and set up for. He has been talking about this for months now. This was the first year that Joe got really excited about his birthday, and it felt like such a big deal! In the past year, we've seen Joe really blossom socially - he looks forward to seeing his friends at school, and is a lot more outgoing with adults too. He delights us everyday with his funny remarks and jokes. He knows his numbers and most of his letters, and has surprised us by learning to tell time (more or less)! Yesterday he was watching the clock in anticipation of his party starting at four. Our smart, funny, surprising Joe! So of course we threw a giant party for him (to Joe's demanding specifications) and showered him with gifts. There was even a giant number 5 piñata (friends don't let friends go to the party store!). Much fun was had, and now mama and daddy are exhausted and the house is a freaking disaster! I've always been able to say, truthfully, that my children don't have that many toys. After all, we don't have a playroom, so their toys are stored in our living space, and there's only so much room. Well ... as of yesterday, I think we have crossed over the line! Joe got so. many. awesome. presents. After the party, I heard him remark to no one in particular, "I am so spoiled." Haha. You may have noticed that when my life gets really crazy, I have a tendency to start an overly ambitious hand-sewing project, often requiring that I teach myself an entirely new skill. What can I say? There's something calming about a slightly insane hand-work project. Sometimes I even finish them! Oh my! Happy Birthday, Joe! Today is my Susy's birthday :) How sweet! And smocking? You are amazing! I've been too scared to try it, but it looks so cool! Happy birthday to the little dude. And I think I'm a bit similar in that my most ridiculous, unnecessary and, to me at least, amusing projects have come at times when I really should be concentrating on something else! 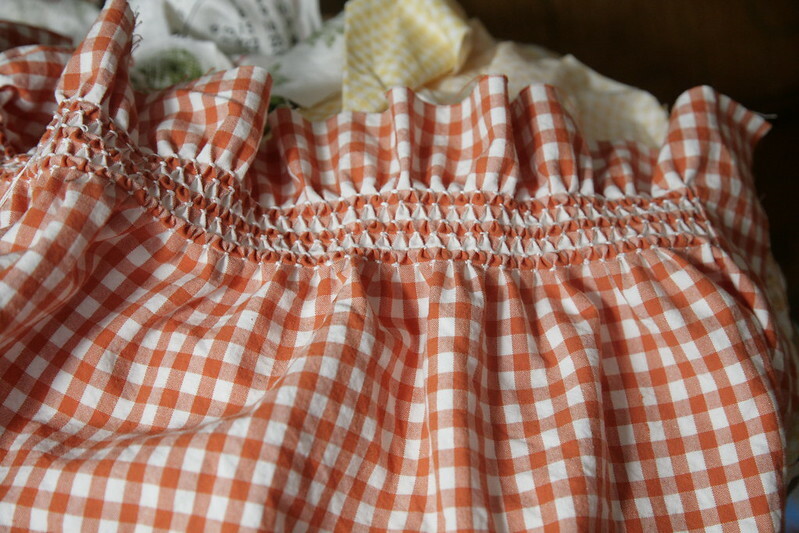 I have so many more practical projects I should be working on instead, but ... smocking! It's just calling my name. Happy Birthday to Joe! I love that collection of photos of him over the years. And that apron is going to be fantastic- look forward to seeing it complete! Happy birthday big guy! Sounds like a fun day. 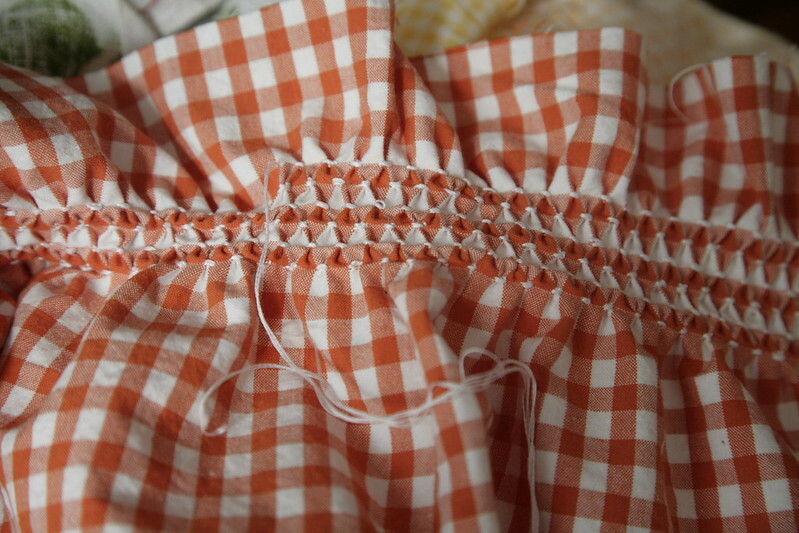 And I'm so excited to learn smocking myself! INDER! I love the new header! So cute! I read this last weekend, but apparently did not comment - pregnesia, I guess! I am so glad Joe's party was so special. Man, birthday parties are so much work. I'm missing that gene. I'm sure he will have such special memories!